The greatest threat to the future comes from the secrets of the past. Abbey and her friends return home after their long journey west to find Holdgate threatened by both an enemy to the south and a hidden Barskall army to the east. Lucky for Holdgate, Abbey and the crew of The Foggy Day are more than ready to defend their home. But there’s an even greater threat to the city… one nobody sees coming. A man with a mysterious connection to Abbey’s past has arrived, and he wants to see the stormships burn. He’s about to learn why it’s never a good idea to mess with Abbey’s friends. 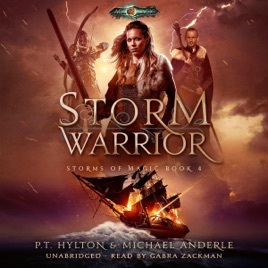 Storm Warrior is a fun, swashbuckling romp filled with twists, adventure, and plenty of banter. Set on the foundation laid by the Kurtherian Gambit Series, Storm Warrior tells an entirely new story in the Age of Magic--and of the heroes and villains who battle for control of its destiny.